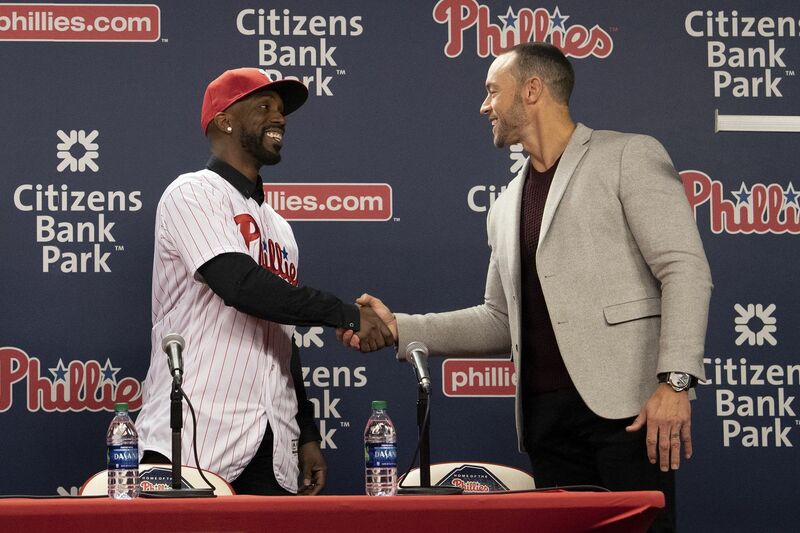 Phillies manager Gabe Kapler (right) shaking hands with new acquisition Andrew McCutchen during a December press conference. Matt Klentak reached for his phone two Saturdays ago, nearly a week away from when he was scheduled to board a flight to Clearwater, Fla., and begin his fourth spring training as general manager of the Phillies. He had waited patiently throughout the offseason for Bryce Harper and Manny Machado to decide where to sign as free agents, and he’s still waiting. Meanwhile, Klentak made a series of moves to improve his team as he watched the rest of the National League East bolster their rosters, guaranteeing that the race for the 2019 division crown will be much stiffer than last year’s title hunt. But Klentak, more than a week before the Phillies would gather for the first time this spring, knew his team still needed to get better. The moves he had made earlier this winter were efficient. But were they enough to keep up? So Klentak reached for his phone. “Innocently enough, it started with a text message,” Klentak said. He asked the Marlins what it would take to land J.T. Realmuto, the premier catcher about whom the Phillies had inquired earlier in the offseason. This time, after an offseason of patience, things had changed. That text message led, five days later, to the biggest trade of Klentak’s time with the Phillies. The Phillies have yet to sign Harper or Machado, and a decision there does not seem to be coming soon even as pitchers and catchers report to spring training. But the Phillies still managed to get better. And the acquisition of Realmuto, less than a week before camp opens, is enough for the Phillies to begin spring training knowing they have a shot in a loaded division. Klentak this winter added baseball’s top catcher, a shortstop (Jean Segura) whose aggressive swing was exactly what this lineup needed, a veteran outfielder with a proven track record (Andrew McCutchen), and a relief pitcher (David Robertson) who can tackle the late innings the way that manager Gabe Kapler prefers. And they remain optimistic about adding Harper or Machado — by the end of this month, they hope — to their roster. Still, the Phillies have molded themselves this winter into a division contender. Three players they shipped out this offseason — J.P. Crawford, Carlos Santana, and Jorge Alfaro — were replaced by substantial upgrades: Segura for Crawford, Rhys Hoskins for Santana at first base, and Realmuto for Alfaro. Pitching prospect Sixto Sanchez was a tough loss in the Realmuto deal, but sometimes you have to subtract value if you’re looking to gain it elsewhere. The Phillies competed last season in a division that was mostly a two-team race. The Marlins were the Marlins. The Mets were so bad in May and June that it didn’t matter how they played the rest of the season. The Nationals had a stretch of dysfunction that led to a summer fire sale in which Harper almost got traded. The Phillies knew that the Braves, who won the division as the Phillies collapsed, would not be their only competition this year. David Robertson is a big addition to the Phillies bullpen. The Mets hired an aggressive general manager, held onto their two elite starters, and acquired second baseman Robinson Cano and relief pitcher Edwin Diaz. The Braves added third baseman Josh Donaldson to a lineup that already featured two of baseball’s best young players, left fielder Ronald Acuna and second baseman Ozzie Albies. The Nationals might lose Harper, but they outbid the Phillies for left-handed starter Patrick Corbin, traded for catcher Yan Gomes, and signed second baseman Brian Dozier to supplement a lineup that includes outfielder Juan Soto and third baseman Anthony Rendon. The Marlins are still the Marlins. Baseball Prospectus published its annual PECOTA projections last week and predicted that the Phillies would finish with 84 wins, which would be tied with the Braves and five behind the Mets and Nationals. The Braves won the East last season with 90 wins. The second-best team, the Nationals, had 82, and the Phillies had 80. This year, the division is projected to have four teams better than last season’s second-place club. A few hours later, the Phillies added Realmuto and their projected win total jumped by two. The Phillies, according to the projections, had gotten better. And one more big move could project them as a division champion. Expect Klentak to be reaching again for his phone.